Miguel Jackson is the prisoner beaten with a hammer-like object in retaliation for his role in the December 2010 mass sit-down strike to raise awareness about slave labor and other atrocities at Georgia's massive Diagnostic and Classification prison, what CBS Atlanta reported the inmates call "unreasonable and inhumane treatment by prison guards and officials." "A hunger strike by 10 inmates at the Georgia Classification & Diagnostic Prison has ended, according to the Department of Corrections. The strike, which sparked a protest at the state capitol building Monday, lasted from June 10 to July 6. Corrections is also denying claims that it mistreated the striking prisoners. "'The hunger strike ended when inmates requested food from GDC officials,' said Dabney Weems, a public relations official." Families and an attorney for the prisoners, however, "insist that the nine hunger strikers remain resolved and continue to insist on administrative review of their status, adequate medical care, and access to mail and visitation privileges with their families and attorneys which have been arbitrarily denied them," reports San Francisco Bay View News, based on the story by Bruce A. Dixon, managing editor at Black Agenda Report where this story first appeared. "Eighteen months after Georgia Department of Corrections employees brutally suppressed a non-violent work stoppage led by inmates in as many as eleven of the state's 34 prisons, it is believed that the "Hidden-37" have been in solitary confinement ever since. The Georgia Green Party today called on Governor Deal to end the torture; and on Georgians to join hunger striking Georgia inmates in a one day solidarity fast." "Prison officials are surprised at the level of outside support the inmates enjoy despite a virtual news whiteout," states Bruce Dixon, editor of The Black Agenda Report. "Miguel and other inmates at Georgia Diagnostics have been denied access to proper hygiene [and] medical treatment for their numerous and severe injuries, many of which were inflicted 18 months ago," wrote Delma Jackson in a Change.org petition. Jackson's family alleges that he was beaten by prison guards at Smith State Prison in December 2010, transferred in 2011 to the Georgia Classification & Diagnostic Prison where he has been kept in solitary confinement for the past 18 months. "[The Georgia Bureau of Investigation] investigated the claim filed by inmate Miguel Jackson regarding the 2010 Smith State Prison incident and found no validity to the inmate's complaint," stated Dabney Weems, a public relations official. According to the ACJ, the department also said Jackson has not been in solitary confinement. "As the international community has examined the research, including over a century of scientific studies suggesting that prolonged solitary confinement leads to irreversable mental degredation, experts have found that use of segregation for period in excess of fifteen days constitutes torture and cannot be supported under existing international standards for human rights." "Unfortunately the peaceful demonstration was cut short by the brutal beating of inmate Miguel Jackson and others who were allegedly targeted for participating in the protest," reported CBS Atlanta on Monday. "Thirty-seven of the men who participated in the original hunger strike were singled out as leaders, and as punishment they were sent to the Diagnostic and Classification Prison, where they were placed in solitary confinement." A Solidarity Rally will be held Monday at the Georgia Department of Corrections headquarters, 300 Patrol Rd., Forsyth, Ga.
"Your phone calls to the prison warden, the Department of Corrections and the governor of Georgia have already made a difference," stated San Francisco Bay News editor, Mary Ratcliff. "Delma Jackson, wife of hunger striker Miguel Jackson, asks everyone to 'post this flier on social media, blogs etc. It is imperative that we build awareness and gain all the support we can.' Click to enlarge." "Whether or not the hunger strike lasts much longer, the nine prisoners involved have already demonstrated their unshakable resolve and deserve your continued concern and support – and your calls, which are still needed," states Ratcliff. "When you call, ask about the men by name and ID number. Here are the names and ID numbers of the nine prisoners now in the fifth week of their hunger strike." 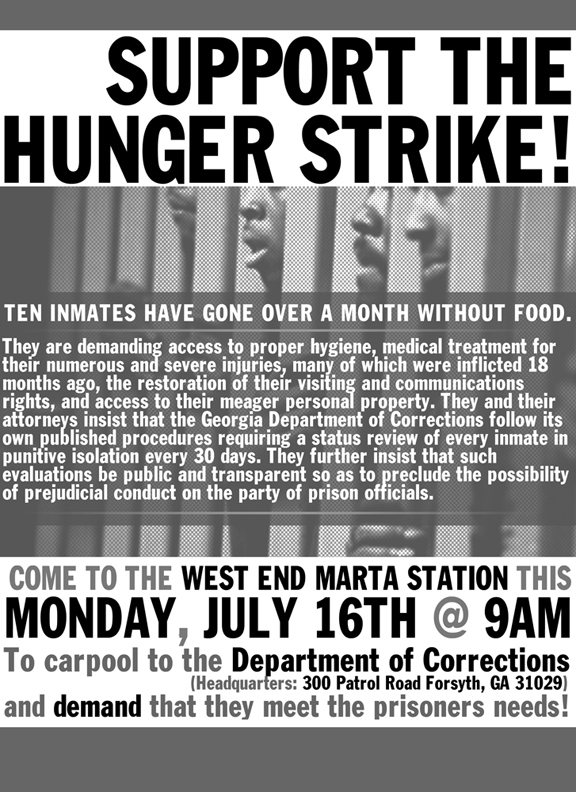 “We’re also having an international call-in day to support Georgia hunger strikers this Monday, July 16,” said Delma Jackson.